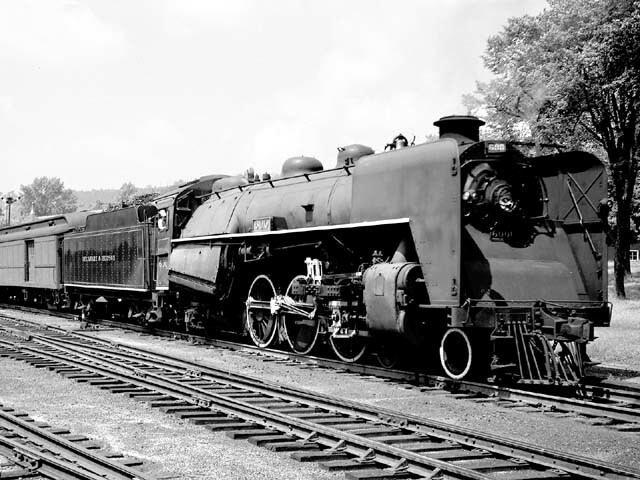 No D&H steam locomotives have been preserved with the exception of two pieces, ironically from the first and last steam on the D&H. The boiler from the Stourbridge Lion is in the Smithsonian Museum, and a 300-class tender is currently employed on CP Rail to haul water for one of their remaining steam locomotives. 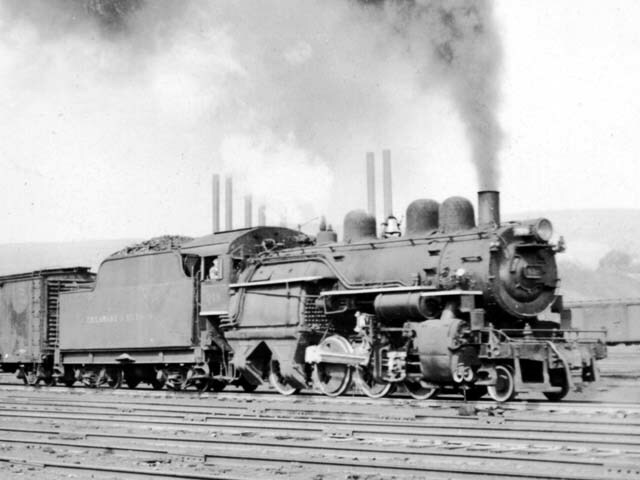 All other D&H steam locomotives were scrapped. A replica of the Stourbridge Lion was built by the D&H in 1939 and is currently on display at the Wayne County Historical Society Museum along with the Eclipse, a gravity rail coach. Pride of Newcastle / America 0-4-0 1829 Robert Stephenson & Co.
374-378 4-4-0 G-4b 1883-1887 Dickson Manufacturing Co.
388-390 4-4-0 G-4d 1895 Dickson Manufacturing Co.
391-393 4-4-0 G-4c 1895 Dickson Manufacturing Co.
E-3 and E-3a original numbers (as of 1906) before extensive 1920s rebuilding program. Second listing of E-3 class engines by final number (separated by sub-class). NOTES: Built by Dickson in 1884 as a tank engine, the unit was rebuilt in D&H Oneonta Shops in 1898, still as a tank engine and was scrapped in August of 1928. NOTES: New York Central's Hudson River freight bridge is in background. 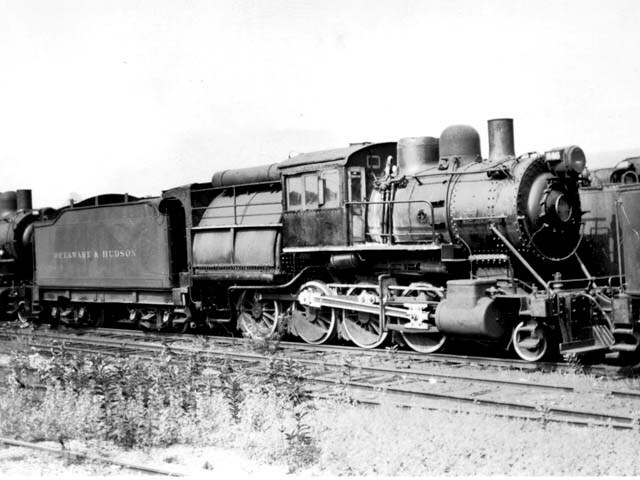 Manufactured by ALCo, Dickson Works for the Delaware & Hudson in 1903 and was scrapped in November, 1947. NOTES: Manufactured by ALCo, Dickson Works for the Delaware & Hudson in 1907 and was gone from the roster by January of 1946. 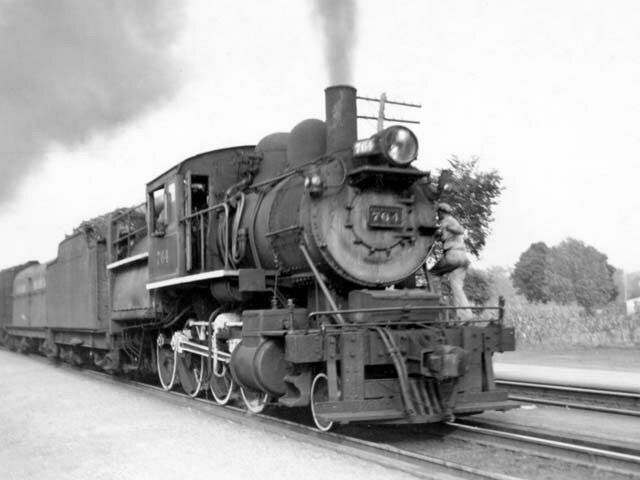 "A picture of my Uncle Ned Purington on the left, with the steam engine, just before retirement. My uncle died in 1959 and lived in Gansfort, N.Y"
NOTES: Switching in snow storm opposite passenger station. 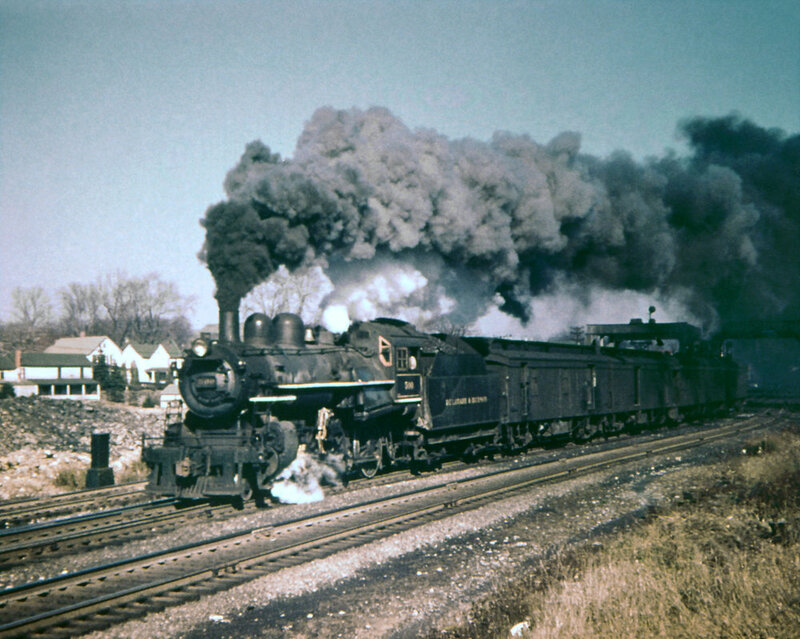 Rebuilt from 2-8-0 E-4 #1002 in April, 1923, sold to Luria in March, 1950. 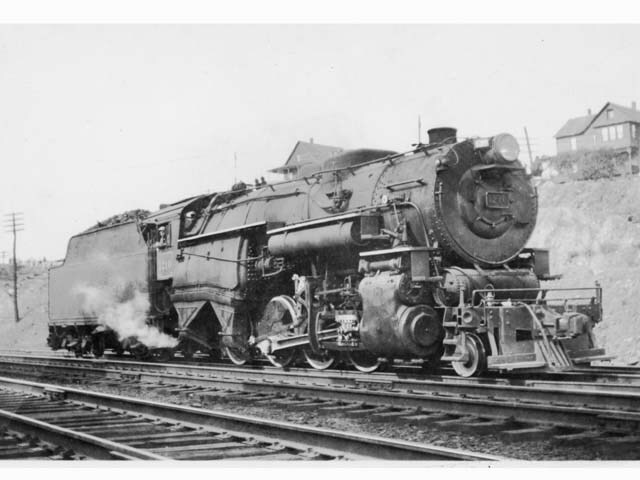 NOTES: Rebuilt from 2-8-0 E-4 #1006 in April, 1923, sold to Luria in August, 1951. 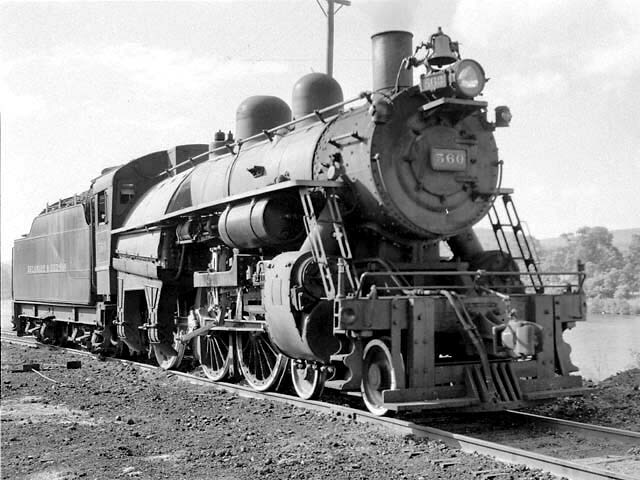 NOTES: Built from E-3a's #887 frame and boiler from 2nd 884 in April, 1930 and sold to Luria in August, 1953. 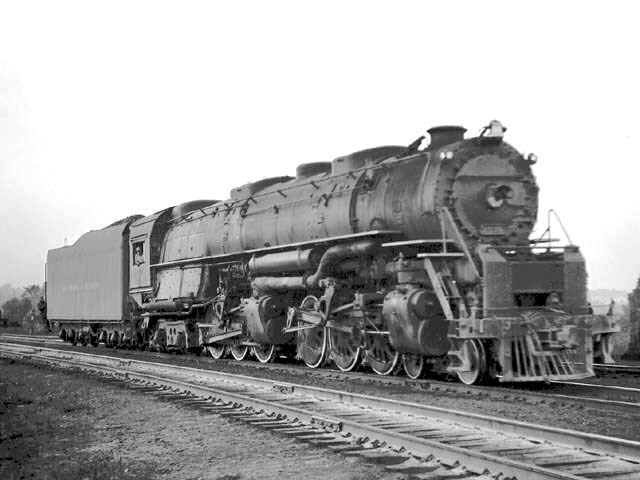 NOTES: Rebuilt from 2-8-0 E-4 #1020 in April, 1927, sold to Luria in February, 1953. 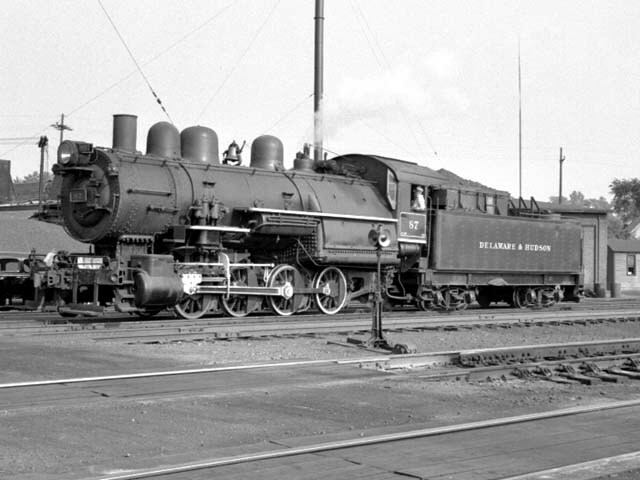 NOTES: Built by Alco-Schenectady in 1943, Sold to Luria in August, 1953. NOTES: Southbound freight approaching passenger station. 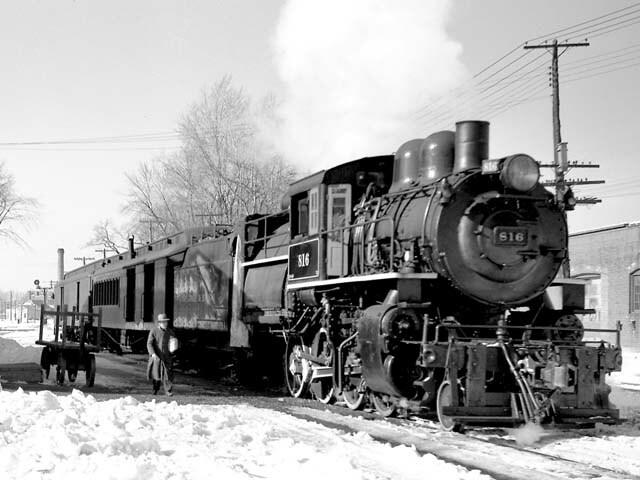 Built by Alco-Schenectady in 1943, Sold to Luria in October, 1952. NOTES: Leaving Fort Edward with train 4 (Whitehall-Albany local). 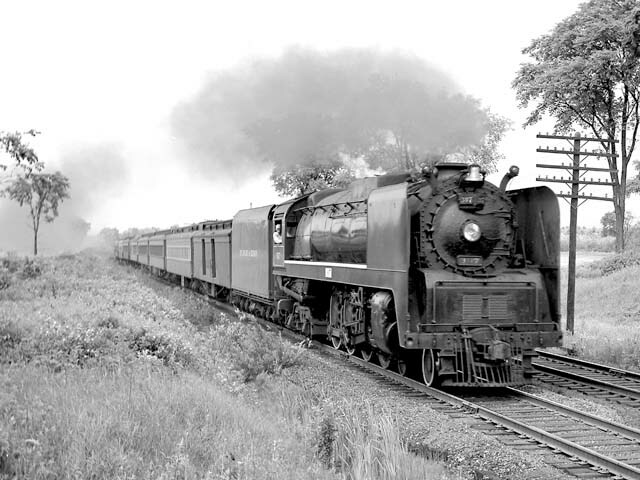 Built by Alco-Schenectady in 1943, Sold to Luria in October, 1952. NOTES: Turning on south wye; will lead Lake George-New York passenger from from Fort Edward to Troy after train arrives off Lake George branch. Built by Alco-Schenectady in 1943, Sold to Luria in August, 1953. NOTES: Pushing southbound freight. Built by Alco-Schenectady in 1943, Sold to Luria in August, 1953. NOTES: On southbound Laurentian. Built by Alco-Schenectady in 1943, Sold to Luria in August, 1953. NOTES: On southbound "RW" freight. Built by Alco-Schenectady in 1943, Sold to Luria in August, 1953. NOTES: On northbound Laurentian. 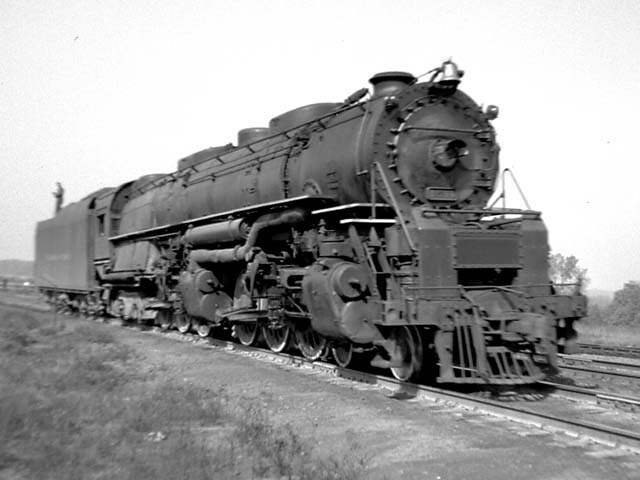 Built by Alco-Schenectady in 1943, Sold to Luria in October, 1952. NOTES: Arriving with southbound Laurentian. Built by Alco-Schenectady in 1943, Sold to Luria in August, 1953. NOTES: On southbound freight. 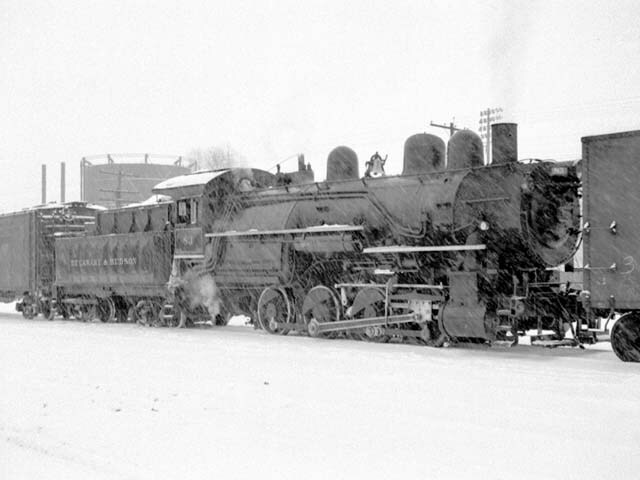 Built by Alco-Schenectady in 1943, Sold to Luria in October, 1952. NOTES: Manufactured by Dickson for the Delaware & Hudson in 1889, the locomotive was rebuilt in 1897 by the D&H Oneonta Shops and was gone from the roster by January of 1917. 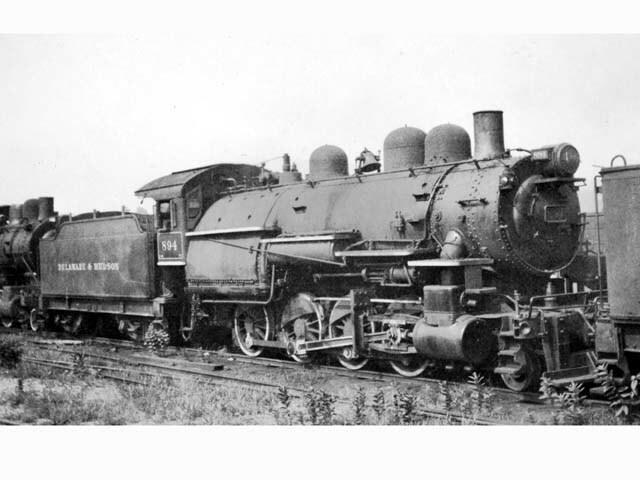 NOTES: Manufactured by Smith & Jackson in 1871, the locomotive was rebuilt in 1898 by the D&H Green Island Shops and was scrapped in July of 1924. 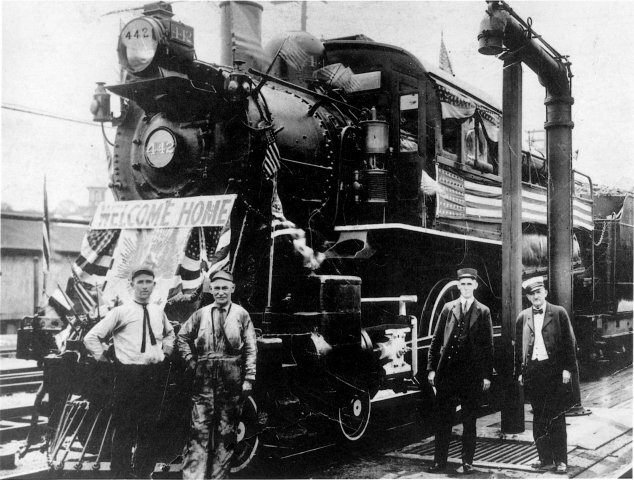 NOTES: Manufactured by Dickson for the Albany and Susquehanna in 1867, the locomotive was rebuilt in 1898 by the D&H Green Island Shops and was scrapped in November of 1926. 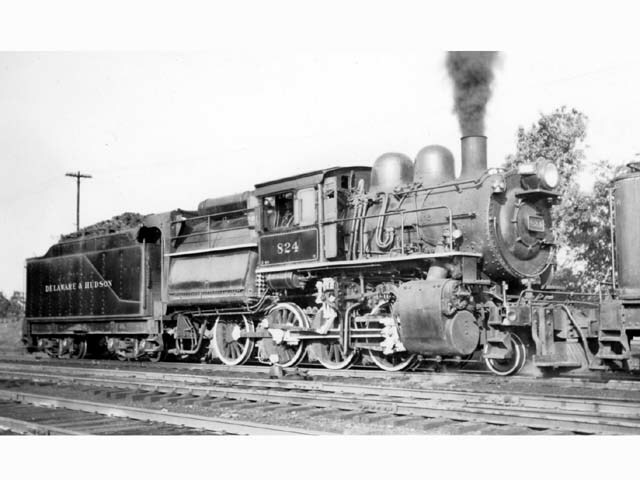 NOTES: Manufactured by Schenectady Locomotive works for the Rensselaer & Saratoga in 1868, the locomotive was rebuilt in 1899 by the D&H Green Island Shops and was scrapped in January of 1930. NOTES: With northbound local to North Creek. NOTES: This picture was taken August 8, 1946. 18 days later, on August 26, the 451 was wrecked in a head on collision at the Glen, NY, while heading a northbound passenger train on the North Creek branch. Its engineer, with more than 40 years of service, died at the throttle. Cause of the accident was found to be the failure of a southbound extra, headed by the 503, to wait at a meeting point. NOTES: At old Saratoga station with southbound passenger; note unusual large stack. NOTES: At passenger station with Albany-Binghamton local. NOTES: Double heading with 653; the 537 led the southbound train from Lake George; the 653 was added for the mainline run to Troy, where the New York Central will forward the train to Grand Central. NOTES: Ready to depart for Lake George. NOTES: Ready to depart for Saratoga. NOTES: On southbound "RW" freight. LOCATION: Lanesboro, PA, under Starrucca Viaduct. NOTES: The Challengers began joining the D&H roster in 1940 were part of a family sired 14 years earlier in the creative minds of American Locomotive Company and Union Pacific motive power engineers. J.R. Quinn Photo/The ALCo Collections. Obtained from CompuServe TrainNet and used by permission.